This is an image I composed a year ago in the same location I shared with my client. While the conditions during my image capture were more extreme, and the mood a bit darker, I wanted to show the general creative effect of using long exposure soften the scene, enabling the stationary subject to be the main focus of attention. A short exposure would render sharp lines in the water and sky that would act as distracting details in an overly busy composition. I have taken a bit of a break from sharing here on my blog. It seams that I am inclined to share only when I really have something to say. Perhaps I need to push harder in order to share more regularly? I enjoy the process of sharing, but often get caught up in the day to day aspects of business and bog down. Fortunately, I just took part in one of the best learning processes anyone can have. I taught. I lead a private workshop with a client who was extremely open to getting out in non-ideal conditions and very much wanted to learn and create. The tone of our experience was wonderful. While he was hoping to photograph billowy white clouds in a deep blue sky above the calm blue waters of Lake Tahoe, we took what Mother Nature offered up and created the beautiful images that were possible. With a winter storm just starting to break, we were faced with dark choppy water and layers of separating cloud under thin cloud. The first location we visited offered up a simple, somewhat minimalist composition. In order to put the focus on the small island and trees and ad a sense of calm, I had him use a very dark, 10 stop neutral density filter over his lens. This enabled him to lengthen his exposure time dramatically, creating a smoothing effect on the choppy water and softening the clouds. The resulting images were tranquil and moody, conveying how my client felt more so than how the literal scene appeared. As we worked our way through the process of composing, critiquing, asking and answering questions, shooting and discussing results, we both felt the joy of the process. My client was extremely pleased with the refinements I helped him make. As most aspiring photographers I work with are, he was impressed by the huge impact a few very minor adjustments in position, perspective and composition can have on the resulting image. It was motivating to see how I was able to add such a spark to his creative process and enable him to refine his results in such a short time. In the end, after just a morning of helping a fellow photographer refine their craft in the field, I became excited to get back in the field, here in Lake Tahoe, with my large format cameras. The process of working through another artists “sticking points”, and seeing their success, invigorated my desire to get out in the field and work through my own creative process. I am welcoming the experience of seeing through the lens and composing images that move me. Images that are refined, elegant and capable of having a positive impact on people’s lives. This is “The Fine Art of Nature”. Well, I hit the half century mark. 50 years on the planet. And to celebrate, my family allowed me to drag them out for some high altitude camping to a place I've wanted to visit for many years, the Ancient Bristlecone Pine Forest. Located in the White Mountains of California between 10-11 thousand feet in elevation, the most ancient trees on the planet are amazing. It was well worth the trip. Now, our first day was primarily a driving day. We left Lake Tahoe (our home) and drove for almost 4 hours to our camping location at 8,500 feet. After setting the tent up, we quickly drove another 5 miles up to 10,000 feet, and the location of the Schulman Grove of Ancient Bristlecones. Given our late arrival, we hustled along to the four mile loop trail hike, which ended with the last mile of hiking in the dark...cool adventure. The highlight of our hike was the section of "forest" which contained the eldest of the trees. We were literally able to FEEL the energy in this place. The trees are gnarled, twisted, mostly without bark, and just hanging on to life. The oldest of these amazing beings is over 4,500 years old. I actually felt young here:) This type of experience, where I literally feel the power of nature and its ability to endure, is where my passion for photography was born. It also happens to fuel my passion for life. This emotion is why I do what I do, and share it with the world. After our late adventure, we returned to camp, had a quick dinner and happily crawled into our sleeping bags for the night. The following day was spent exploring at a relaxed pace. We drove up to 11,000 feet and casually explored the Patriarch Grove of Ancient Bristlecone. It was beautiful, a bit cool, and a nice escape from "the world" we've created back in civilization. The family time was fantastic. We followed this up with a lunch excursion in the town of Bishop at the world famous Erik Schat's Bakery. I recommend the stop if passing through. After lunch we returned to camp and relaxed for a short while. Then, it was on to my desired photo location to scout for the evening shoot. We all did the short walk to the trees I wanted to photograph. I hadn't had enough time to find any distant lone trees on this first visit, so I chose a well known, and still extraordinary pair of trees for the occasion. I then took everyone back to camp to relax and sleep while I ventured back to my photographic subject. The plan was to capture a Milky Way image with my Nikon DSLR, and an all night exposure with my large format film camera. I had my spot picked and composition set up long before dark. This gave me plenty of time to focus, strategize and plan. For the shot you see above, I took one shot during the blue hour of light while there was enough ambient light for a low ISO, small aperture shot. This provided great detail in the trees and foreground with no noise, and just enough soft light to intimate that this was nighttime. 45 minutes later I took a second exposure for the sky. Here I used a very high ISO along with a wide open aperture in order to "collect" enough light to define the Milky Way. I processed each image in Lightroom CC 2018 and blended them together manually in Photoshop CC 2018. The result is a dramatic, harkening back to a time when these ancient trees were able to soak in the starlight in complete solitude. I believe the resulting image is a fitting tribute to that time, and perhaps to my short 50 years here with them. Well, just after I made my (would be) final exposure of the night, I heard my 13 year old son's voice calling to me in the dark, "Jon Paul, are you there?". While my wife can hammer the trails at high altitude, she occasionally has trouble sleeping up high. While I was shooting, she became extremely ill. Altitude sickness is horrible! Nausea, splitting headache, and progressive loss of rationale. Louise knows how to handle bad situations, and to act before they become very bad. She and Toby hitched a ride up to the trailhead we had scouted earlier and hunted me down in the dark at over 10,000 feet. I packed my gear, and down the mountain we went. After breaking camp in about 4 minutes, we headed back to the valley and made the long drive home. I can happily report that Louise felt much better by morning. Amazingly, her only concern was cutting into my birthday celebration and photography experience. Needless to say, I never had the opportunity to capture my all night film exposure. I'm extremely pleased with this new Ancient Bristlecone & Milky Way image, I had a wonderful time with Louise and Toby, and I look forward to another visit in search of my next film image. This experience embraced "The Fine Art of Nature", for all of us. This image is ready to be released and is available for your collection! Please contact me directly and I will help make your purchase possible. Click Here for assistance! With Fall approaching I thought I'd share a new (yet to be released) gallery image that is a contrast to the coming season of color. I hope you enjoy the story...and the image, of course. In June of this year I was commissioned to create a volume of forest images for a forestry investment company. Given the massive amount of land covered, and the required number of images, I did the entire project with my Nikon DSLR. However, I did pack my large format film gear, as I had a great distance to travel both to and from locations, as well as to and from home. While I only had one occasion to use the big camera and expose one sheet of film, it was well worth bringing the extra bag. As I traveled between the coast and Mount Shasta, I crossed a bridge above a forested ravine. As often happens, at 60mph, this tree screamed to me. In a blur, I was struck with emotion. I knew I had to stop. Just past the bridge was a dirt turnout that I quickly pulled into. After waiting for a logging truck to pass, I ran onto the bridge to inspect what had caught my eye. The contrast of this fir tree skeleton draped elegantly in pale moss, against the dark green of the conifer forest was extraordinary. I knew I had to capture this moment, quickly, while not endangering myself. I ran back to my car, set up my 5x7 field camera with the 4x5 film back, attached the 210mm lens, attached the cable release, put my focussing loop in my pocket, hung my light meter around my neck and attached the dark cloth to the back of the camera. After a lone truck passed, I ran back out the location I scouted and carefully positioned myself on the 3 foot wide ledge on the "safe side" of the guard rail. Carefully, I composed and focussed the camera. The scene was in open shadow, so the exposure was relatively easy. I loaded my film holder, exposed one sheet of film and ran back the car safely and satisfied. Now, I envisioned this scene as a black and white from moment one. However, I only had color film with my on the trip. So, I exposed my one sheet of Fuji Provia 100F with the purpose of printing a black and white image. I did not have a large contrast range, but knew I could expand the contrast as desired after scanning my film. I also know that Provia 100F holds beautiful shadow details. So, I exposed my film for the light colored moss, making sure my highlights were safe, and stood out nicely against the darker evergreens in the background. I envisioned a subtle, elegant image, and knowing my equipment and media (film, processing, development, printing processes) enabled me to bring this vision to fruition. This image is now available for your collection, but has yet to be displayed in the gallery. If you are interested in purchasing one of the first prints, contact me directly so I can connect you with the perfect art consultant! Well, the nighttime temperatures are dropping here in the mountains and that means one thing, Fall is on the way. Although I'll be happy to hang on to perfect bike riding weather for as long as possible, the photographer in me is excited to compose images of natures greatest show. So, in anticipation, I ordered FILM! Big film (8x10, 4x5 and 6x17). I'm sure you're curious about which "flavors" of film I stock up on for the fall season. To be honest, it's the same film I use any time of year. I like to keep things simple, repeatable and dependable. I primarily use two specific color films, Fuji Provia 100F Transparency Film and Kodak Ektar 100 color negative film. Let me explain. To begin with, Fuji Provia 100F is my primary film. I shoot this stock for 90% of my color work. The qualities of this film make sense for my style and the outcome I desire, extremely large (measured in feet) gallery prints that are true to life. I am quite conscious of the fact that people viewing my large gallery prints describe them as "clear", as opposed to "sharp". Provia 100F has extremely fine grain, saturated but realistic color rendition and can handle extremely long exposures. So, if the exposure latitude (range between highlights and shadows) is "reasonable", and I believe that I can capture the entire exposure range in one shot, I use Provia 100F. Period. I expose Provia 100F using an average meter reading, but I am most concerned about exposing the highlights correctly. If those are lost, there is no recovering them. The shadows, on the other hand, retain detail beautifully if not horribly under exposed. This film also scans extremely well, so we are able to fine tune our image in the digital darkroom with great accuracy. From there, given we are using large film and quality scanning, we can produce enormous prints with wonderful detail. Fuji Provia 100F Transparency Film is my film of choice for Fall, as well as our more subtle seasons. The second color film I carry is Kodak Ektar 100 Color Negative Film. This film has extremely fine grain (Kodak calls it "grainless"), is saturated and, most importantly for me, has a much greater exposure latitude (greater exposure range from highlight to shadow) than slide film. Why don't I use this 100% of the time you ask? Because I find that it is much more of a challenge to correct the color after scanning than the transparency film. Now, the film scans very clean, relative to grain (it's actually designed for scanning), but I just feel as though I battle to bring my scanned file back to what I actually saw in the field. That said, if I can't capture the full exposure with my Provia 100F, Ektar 100 can often make that one exposure possible. Now, opposite of the transparency film, color negative film holds highlights amazingly well. Shadows, not so much. Therefore, I expose with total attention on maintaining shadow detail and have faith that the film will save the highlights. To sum things up, I primarily shoot large format color film, scan that film and produce huge prints. 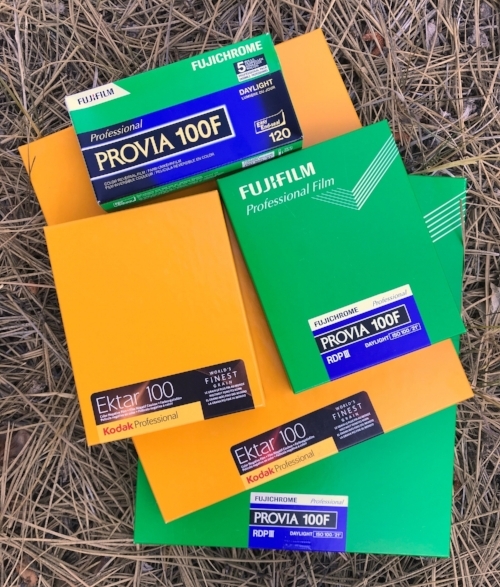 The two films I choose to carry are Fuji Provia 100F Transparency Film and Kodak Ektar 100 Color Negative film. Both of these films enable me to capture the images I compose in the outdoors with the quality, and qualities, required to produce huge prints with the detail, color, contrast and subtlety I require in my gallery prints. They each have their strengths and weaknesses throughout my artistic process so I use them accordingly, depending on the natural conditions presented. In the end, I capture my images with one exposure on a big sheet of film. Keeping it simple enables me to focus on my artistic practice in the field and not worry about a plethora of technical choices. I hope you find this helpful. Feel free to comment below or leave questions. Look for a corresponding video on my YouTube Channel as well. Now get out there and expose some film! Jon Paul with a huge panorama framed and ready to ship to a new collector! Bringing his emotional experiences in nature to life with big film, and sharing them with the world, is what Jon Paul does. I thought it might be insightful to share the pinball like direction I've been bouncing around in lately. In an effort to share myself and my art with the world, I have been producing Youtube videos. This medium is a great way for me to communicate and share experiences from the artist/human perspective, motivate aspiring photographers and share tips and insights about photography. Since video is relatively new to me, I've watched how other people have been producing their videos. This is a good thing for video creation but, inevitably, I let their subject matter affect me. I wander into realms of information, types of photography, technical methods, etc., that aren't "ME". Unintentionally I find myself trying to produce what my subconscious mind thinks people want. This is frustrating! I need to stick with "ME", what I do, why I do it, who I am and how I do things. Simple. My experiences and my art. Fortunately, I realize when I start to "wander" much sooner these days. As it turns out, these wrong turns reaffirm who I am as an artist and how strongly I feel about what I've chosen to do and how I've chosen to do it. These hiccups, which we all have in life, can be a gift. I have the opportunity to stand back and realize that I like being a large format film photographer. I love the quality, and qualities, of the big beautiful prints I produce. I love the intentionality and responsibility found in capturing an exposure on a big sheet of film. And I love my ability to stay true to my vision using a modern digital darkroom to bring my experiences to life in grand scale. I find it interesting, difficult, frustrating, disappointing (all normal), and also helpful and motivating to want to pull myself back onto my chosen path. After 20 years in business, and as a parent, I've learned the true value in mistakes, failures and deviations. We are almost always moved into a better direction with greater focus and conviction. As an artist, this reinvigorates the passion required to go beyond taking pictures and being able to produce what I call, "The Fine Art of Nature". Now I hope you'll follow along as I share who I am and what I do with a bit more clarity. I welcome your comments, insights and requests for information you'd like me to share here and in my Youtube videos. (Corresponding Video HERE)Thanks again for joining me. When opportunity knocks, you've got to be ready. Living in the mountains can make this saying wonderfully appropriate. I looked out my front window just in time to see three raccoons in my driveway. as luck would have it, my wildlife setup was in my car ready to go. As I walked out the door toward my car, the little bandits came straight toward me. I waited patiently until they disappeared under my porch, then wandered over to grab my camera. After just a few minutes of patiently waiting for them to reappear, they wandered straight back out toward me. They certainly aren't shy. Needless to say, I stayed clear and acted aggressive when necessary. It's not good to let them feel too comfortable around humans and their unnatural food sources. They casually moved around behind my house and decided to take a detour up onto a large boulder in the yard. This gave me the opportunity to photograph them at eye level while they groomed themselves. This photo captured the beauty and confident natures of these not so little creatures. I really like the environmental portrait their vantage afforded me. The Fine Art of Nature! Don't miss my newest images, insights and special offerings. Subscribe to my FREE insider's newsletter: The Fine Art of Nature Newsletter with Jon Paul! 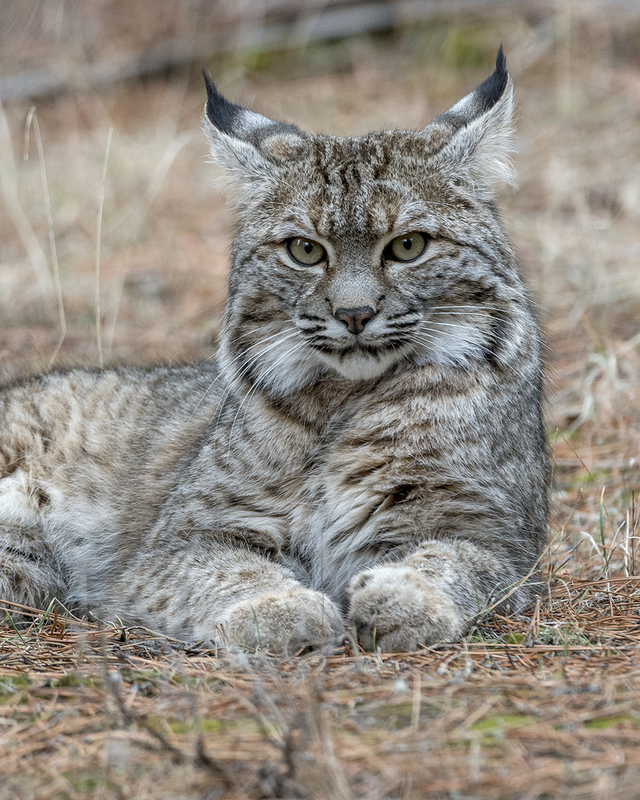 Photographer, Jon Paul, captured these beautiful wildlife images of a bobcat in south Lake Tahoe, California, using a Nikon D800 and Nikkor 200-400 f4 lens. These images are now available as fine art photographic prints. My first 8x10 inch Platinum/Palladium print, "Eagle Falls, Emerald Bay Platinum Morning"
For years I've had a vision of what I would describe as "elegant landscapes". This vision includes characteristics such as fine, subtle detail, subdued colors or tones of black and white, calm compositions and unrivaled archival quality. This vision is based on a feeling that I experience in nature and want to convey through my work. EarIy in my career I moved to large format film photography for its ability to enforce this style in my work. The care required to compose the art, and the fine, subtle detail that came through in my large scale prints brought this vision to life. However, I found that I was still enabling the sensationalized imagery we are all bombarded with to hold me back from truly pursuing the elegant landscape I was conceptualizing. Honestly, I allowed external forces, at least in part, to influence a segment of my color work. I was afraid to take the risk and stray from todays norm. While I was shooting large format film instead of digital, and primarily capturing subdued natural tones, I knew there was an additional path I could follow to fully immerse myself in the pursuit of this vision. For the last several months I have been doing just that. For almost a year I have been studying, pursuing and practicing a very traditional photographic printing method called Platinum / Palladium printing. 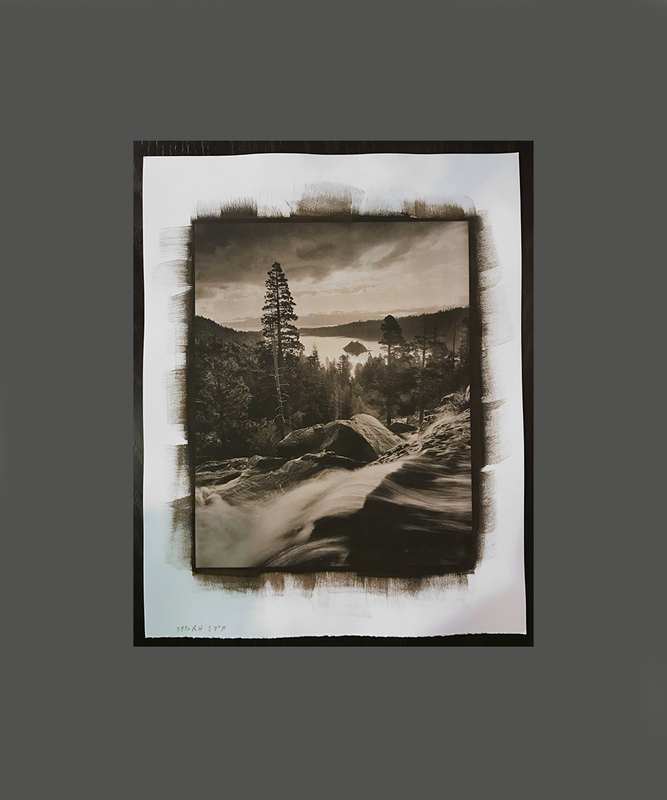 Along with being the most archival printing method available, this black & white printing process is a craft that I control from start to finish. I expose the individual sheets of black & white film, I hand process each sheet of film, I can then choose to scan the film and print larger digital negatives, I mix my own Pt/Pd sensitizer and hand coat cotton rag paper (Hahnemuhle Platinum Rag) making my own photographic paper. I then place the film and paper in direct contact in a printing frame (contact printing) and expose the photograph under UV light within a light box I built by hand. Finally, I develop, wash and rinse the print by hand in my darkroom. I am able to control whether the print is cool in tone (black and white) or warm in tone (light to chocolate brown) by adjusting the temperature of the developer. As an end result, I am beginning to produce the elegant landscapes I have envisioned by taking control of an entirely new manual process that has an authenticity unlike anything I have previously experienced. Not only am I excited about bringing this new process, and extension of my vision, to life as part of my fine art gallery offerings, but I am growing through the process. That is the beauty of art. Through the pain of pursuing a passion, we learn about ourselves and have our entire lives enhanced. Artists, as do most people, have ups and downs. I have allowed myself to focus on learning this process for months. I have also made the investment and taken the financial risk necessary to pursue this vision by investing in the hardware and materials required to produce tests, test prints, failed prints and finally, successful prints. I feel a sense of both pride and fulfillment in having pursued this vision, regardless of the outcome. That said, I am extremely proud of, and excited about, the amazing quality of the prints I am now able to produce. Subscribe to my Free Insider's Newsletter and receive a 40% discount on this image. I am releasing a limited edition of only 10, 8x10 inch Platinum / Palladium prints on 11x14 inch paper. This offer enables my subscribers to obtain a rare historic print at a substantial discount, while helping me progress to producing 16x20 inch Platinum / Palladium prints. Click HERE to subscribe and receive your discount today. If you enjoy this blog, consider subscribing to my Free Insider's Newsletter. I share information, images and offers you won't see anywhere else! Well folks, the results are in! Last week I conducted a survey asking which image people preferred, comparing two identical compositions, shot on two separate sheets of 4x5 inch film. One was shot on color transparency film and the other on black and white print film. I was excited, and very appreciative, to see the number of responses. I also received a lot of additional information and input thanks to a glitch in the survey program I used. Given that the survey didn't seam to work on many mobile devices, quite a few people sent responses, which included further input, via social media, private message, email and social media. Clearly, this was a subject people found interest in. I am glad to have such an insightful group to share with. Thank you! Given the additional input I received, I would like to share the general overtone of that input. A majority of respondents that sided with the color image felt that the chaotic, and relatively low contrast nature of this particular image, gained from the added "dimension" of the subtle color in the scene. I find this exciting, as it touches on a subject I will be writing about soon. Contrast. As a photographer that shoots both color and black and white, chooses to select which sheet of film to use while in the field, and who is strongly drawn to subtle compositions, I have been acutely aware of the two types of contrast available: light/dark contrast and color contrast. I look forward to delving into this subject more deeply very soon! Please follow along and share your input! We can all learn something along the way. This is a split image of the same scene. The half on the left was shot on 4x5 inch black & white film, and the half on the right was shot on 4x5 inch color transparency film. The whole images are below for comparison. Color Version of the image. Black & White version of the image. Thank you for your input! I look forward to sharing the results of this survey. You are invited to subscribe to my FREE newsletter, The Fine Art of Nature, where I share details of my new images found nowhere else! Large format film photographer, Jon Paul, composed this panoramic image of fall foliage on aspen trees in South Lake Tahoe, California using 6x17cm film on his Canham 5x7 metal field camera. New Release - "Autumn Glow, Aspens, Lake Tahoe", by large format film photographer, Jon Paul. The ethereal glow of post sunset atmospheric light illuminates a fall colored aspen grove in Lake Tahoe. Zephyr Evening, Lake Tahoe is a traditional black and white photograph composed by internationally collected landscape photographer, Jon Paul. 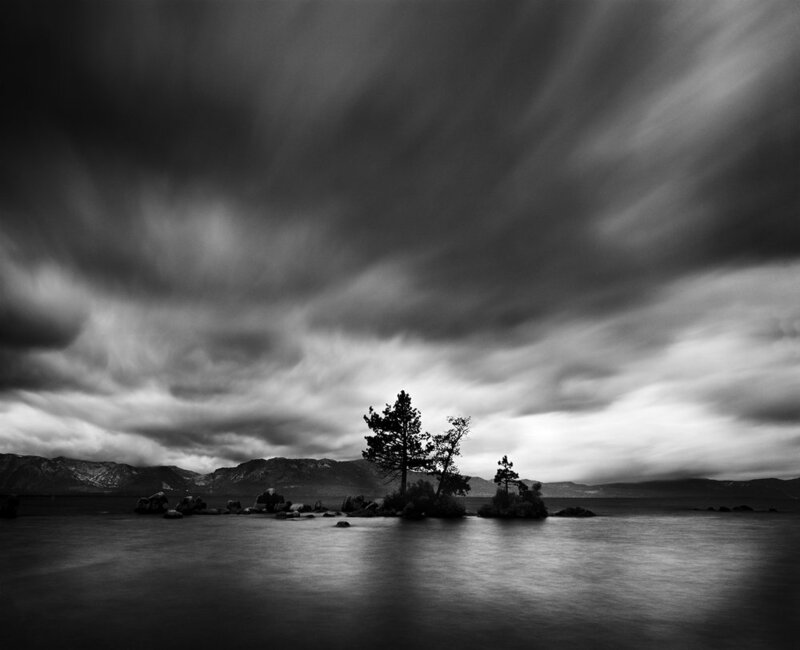 Jon Paul captured this image on 4x5 inch black and white film at Zephyr Cove, Lake Tahoe, Nevada. Composing "High Sierra Snow Cave"
High Sierra Snow Cave is a traditional black and white, large format film image captured by landscape photographer Jon Paul, owner of the Jon Paul Gallery. Jon Paul used a 4x10 inch sheet of film on his 8x10 film camera. The image was captured near Carson Pass in the Mokelumne Wilderness area south of Lake Tahoe. The light of the Milkyway dances above the turquoise light in Lake Tahoe. Bonsai Rock is a beacon in the middleground, as boulders fill the water below. Photographer, Jon Paul, created an amazing vision of this High Sierra Gem in the middle of the night. Another Jon Paul Gallery masterpiece. I was never formally trained as a photographer, or artist for that matter. I was moved to begin taking pictures through outdoor experience. Although I was an outdoor athlete, I was drawn to fine art landscape photography. I never thought too deeply about it. I wanted to capture the beauty I experienced and I wanted to produce beautiful prints for people to hang on their walls and enjoy. It was that simple. Almost two decades later I realize that I still haven't dug too deeply into the conscious aspect of being an artist. It is what I do. Perhaps it is what I was meant to do. However, I do have moments of clarity where I realize I am being compelled to do something. The image above, which I have titled "Loch Fallen Leaf", is a wonderful example of this almost involuntary drive to produce a particular image. You see, I didn't have this exact image in mind. I really didn't have a specific vision. I simply felt the need to continuously visit this area numerous times per day for several weeks. I was pulled there. I felt there was something special and different I needed to compose. I just didn't know what. In hindsight, I must have had faith that something was going to present itself. When it did, I felt it! I knew it, I acted upon it, I composed the image in the format that worked for me and I had it. I was rewarded for my patience even though I had no idea what I was waiting for. Sometimes the magic happens. I just keep coming back for more. So, where does the name, Loch Fallen Leaf, come from? In a past life I was an endurance athlete. I did long triathlons. As part of my training I would do long runs. The run around Fallen Leaf Lake (around 9 miles) was one of my favorites. The far side of the lake (pictured) is basically a goat trail. Rocky, overgrown, quiet. Many mornings I would zen out and run solo along this amazing stretch of rock. Surrounded by mountains and a glassy lake, I would hear the sound of bagpipes reverberating from a canyon above. I never met the bagpipe player, but I imagine, as he stood in that rocky canyon and looked out over the calm waters, he felt the same sense of freedom I did. He transformed my runs into truly inspired odysseys. I imagined I was running in the highlands of Scotland. This image brought that feeling back, and enabled me to express what I felt, all those years ago in this amazing place, through my photography. The image happened! I chose a panoramic format for this image for a couple of reasons. 1) I wanted to accentuate the length and pattern of the shoreline. The mirror reflection created a balance and accentuated the details that were there. 2) If I had used a traditional horizontal or vertical shape for the composition there would have been too much empty space (cloud) for my liking. I find it is very important to slow down and make these sorts of aesthetic decisions in the field while composing the image. All too often people will bang away so as not to miss anything or lose the opportunity. More often than not, when you shoot with this urgency expecting that you can figure it out later when you are in front of a camera, you end up with nothing, or something that is "good". As an outdoor photographer, the outdoors is where I create my art, as that is where I feel it. Immersing ourselves into a scene and consciously composing one image that moves us is far superior to machine gunning with our digital camera and hoping we got it. One great shot far surpasses 1,000 nice ones. Jon's Canham 5x7 inch Metal Field Camera with the 6x17cm panoramic back a few minutes after creating "Loch Fallen Leaf" and the light had gone. One of the things I have been rewarded with through my photography experience is the gift of becoming very observant. I seam to notice little details in the world around me that most people simply walk right by. I take advantage of this ability when I go out scouting for my large format film images. I often hike around my home in Lake Tahoe with a Nikon DSLR while scouting for possible film images and searching for wildlife. I use the time in the field to find potential foregrounds, backgrounds, main subjects, etc. Most often there is not a combination of these that equates to an image worthy of a big sheet of film. However, I have found that some of these individual elements make for amazing natural abstracts all by themselves. As I encountered these amazing natural gems more often, I began capturing them with my professional digital camera. The ability to shoot at very high speed with the professional DSLR makes it possible to capture abstract images that are caused by motion. The above grouping of images is a perfect example of this. As I stood on the river bank scrutinizing a clear reflection of the foliage on the far shoreline, a light breeze began to blow. To my amazement, the gentle, and non-uniform waves that criss-crossed from side to side created extraordinary patterns within the reflection. As I composed one small piece of the waters surface, the image changed noticeably with the motion of the waves. It was exciting to click away, realizing every image was unique. The benefit to observing strong abstracts like these is twofold. Firstly, I have now begun to create an entirely new and different portfolio of work that is a complete departure from my "brand" of large, finely detailed traditional landscapes. Secondly, my large format film compositions are being further strengthened by my heightened awareness of each piece of the composition. I am now seeing a little differently, and I'm a bit more open to the strength of the whole image based upon the sum of its parts. I hope this post will encourage you to see things outside of your "normal" style. Not only might you find a new style of image you enjoy, but it may add something to the style you have been working on. That is the beauty of photography, the possibilities are endless. Ironically, as I have opened up to this new way of seeing, I have also moved toward a more traditional methodology with my big film work. Every aspect of photography seams to compliment the others, if you stay open to it. "Window to Woods Lake, Forest Reflection". A new release by Large Format Photographer, Jon Paul. Compositions in nature grab my attention with the way they make me feel. My art is the translation of that emotion. I use my big film cameras because they enable me, more than any other media I've tried, to do justice to how a place makes me feel. This image is not the result of capturing 1,000 images and choosing which one works. This is THE composition and exposure that I was moved enough to create. These experiences change my life. They keep me going. The final images I produce are my attempt to share that with you. That is "The Fine Art of Nature". “Winter Blanket, Lake Tahoe” has a dreamlike quality. A calm exists here, at this moment in time, that I envision for my art, but I seldom find in nature. The rare atmospheric conditions created a stillness that seamed to wrap the beauty of Lake Tahoe’s grandeur up in a blanket and present it to me. The monotone snow and cloud gently surrounded the rich color of Tahoe’s crystal clear waters, granite boulders and pines. The scale of this place is immense, but this scene creates an intimate feel. This idyllic cove was all that existed, with just our imaginations left to contemplate what beauty lies beyond the blanket of mist. Truly “The Fine Art of Nature”!